We use Pay Pal's secure server to process payments. 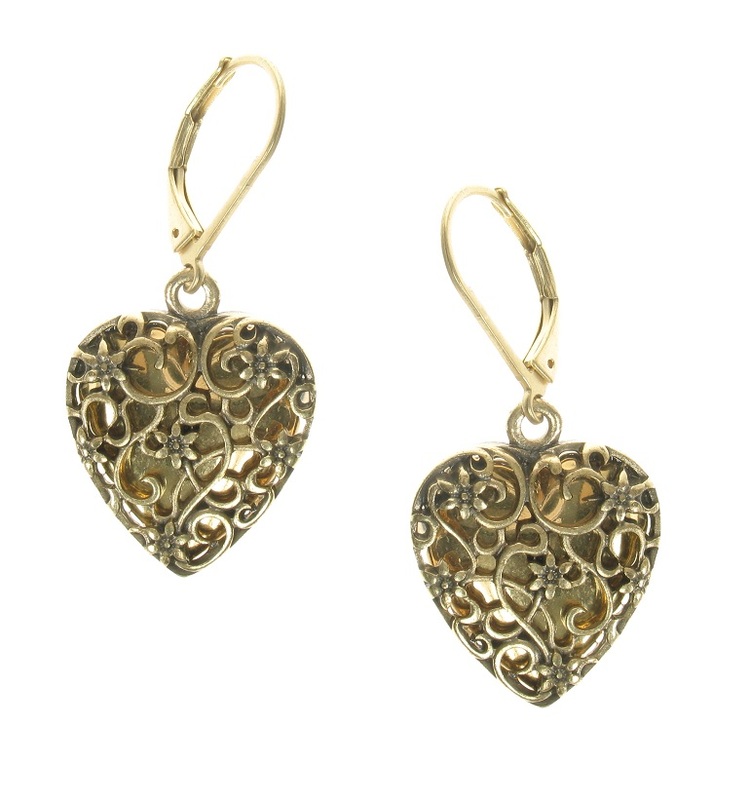 This series is so very pretty, featuring heart shaped lockets with cut-out filigree overlays along with detailed metal charms and an array of tactile semi-precious stone and glass beads. The over-all design has vintage appeal making it a classic wardrobe addition. Available in silver/black, silver/blue and gold/brown. If we don't have it in stock, please do ask we may be able to order it in for you. 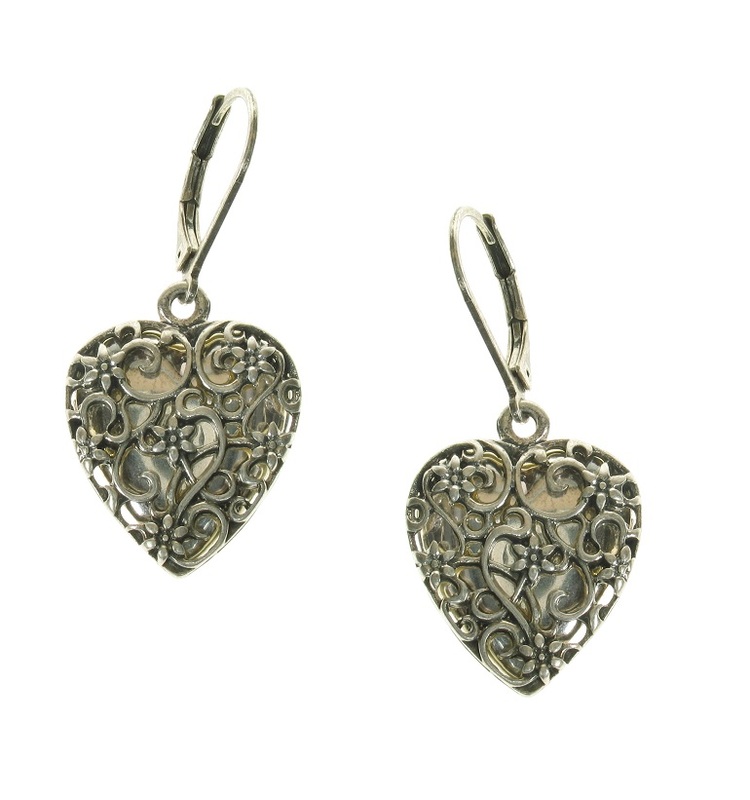 Heart locket earrings with a fretwork overlay. Hearts measure 2cm/20mm. They measure 4cm/1.25 inches in length. Burnished gold plate. French clip fastener for pierced ears. Heart locket earrings with a fretwork overlay. Hearts measure 2cm/20mm. They measure 4cm/1.25 inches in length. Burnished silver plate. French clip fastener for pierced ears. 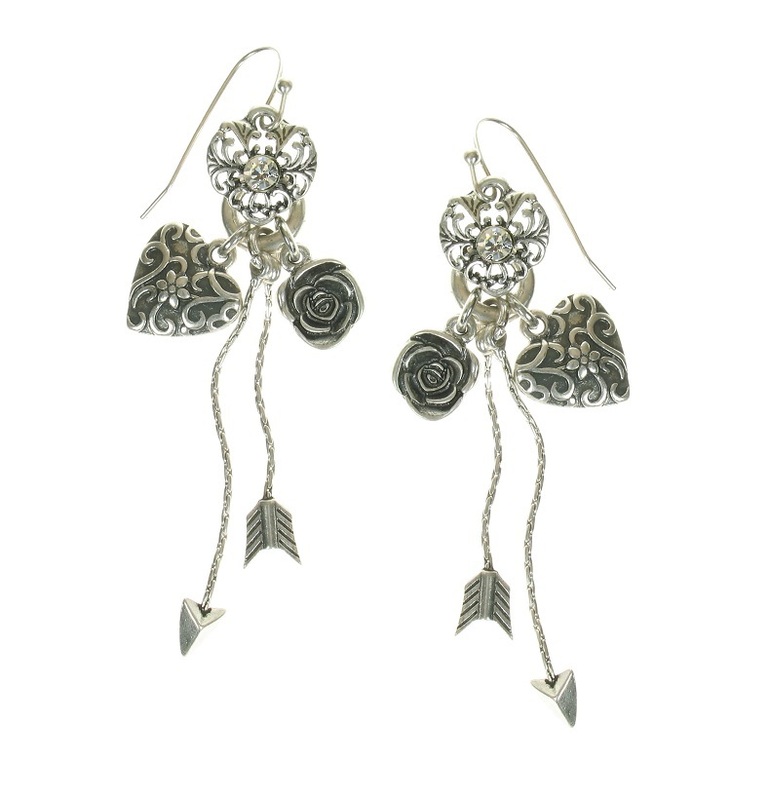 Filigree heart charm drop earrings with a puffed heart, rose and arrow motif. Blue Swarovski crystal. The charms measure from 8mm upto 1cm/10mm. Total length 7.5cm/75mm. Hook fastener for pierced ears. Filigree heart charm drop earrings with a puffed heart, rose and arrow motif. Clear Swarovski crystal. The charms measure from 8mm upto 1cm/10mm. Total length 7.5cm/75mm. Hook fastener for pierced ears. 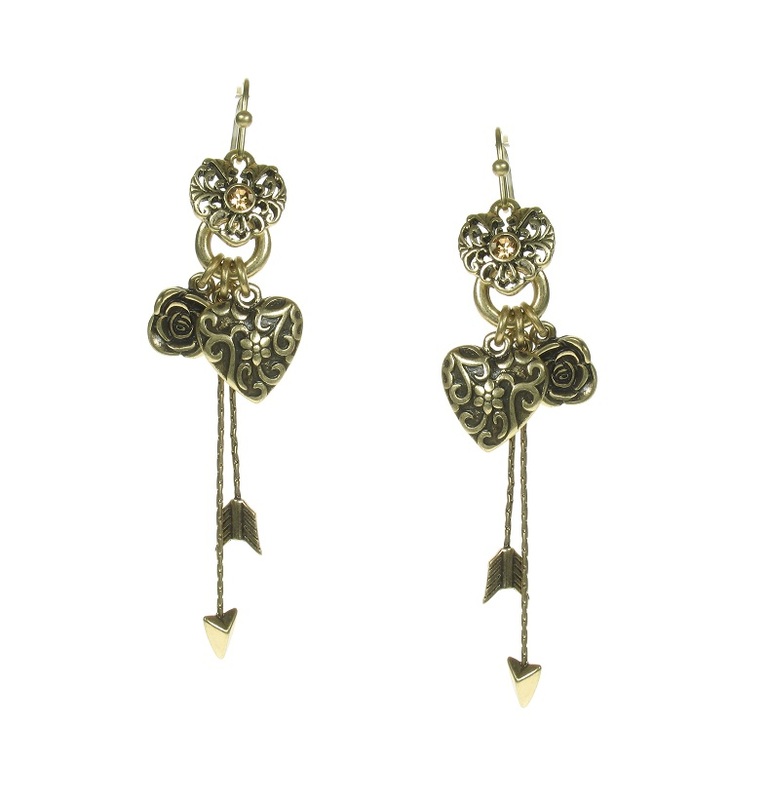 Filigree heart charm drop earrings with a puffed heart, rose and arrow motif. Topaz brown Swarovski crystal. The charms measure from 8mm upto 1cm/10mm. Total length 7.5cm/75mm. Hook fastener for pierced ears. A lovely necklace, the focal is decorated with various floral motifs and other charms, glass and semi-precious stone beads, and a heart locket with a filigree cutout over-lay (3cm/30mm). The charms/beads measure from 8mm upto 3cm/30mm. The necklace is 16 inches/41cm to an adjustable 19 inches/48cm. Burnished silver plate with black accents. 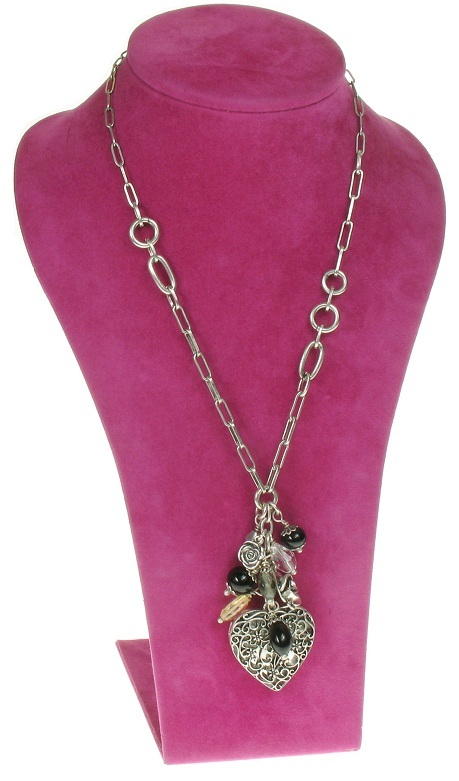 A lovely necklace, the focal is decorated with various floral motifs and other charms, glass and semi-precious stone beads, and a heart locket with a filigree cutout over-lay (3cm/30mm). The charms/beads measure from 8mm upto 3cm/30mm. The necklace is 16 inches/41cm to an adjustable 19 inches/48cm. The length of the front drop is 7cm/70mm. Burnished silver plate with blue accents. A lovely necklace, the focal is decorated with various floral motifs and other charms, glass and semi-precious stone beads, and a heart locket with a filigree cutout over-lay (3cm/30mm). The charms/beads measure from 8mm upto 3cm/30mm. The necklace is 16 inches/41cm to an adjustable 19 inches/48cm. Burnished gold plate with brown accents. A double stranded longer length necklace. 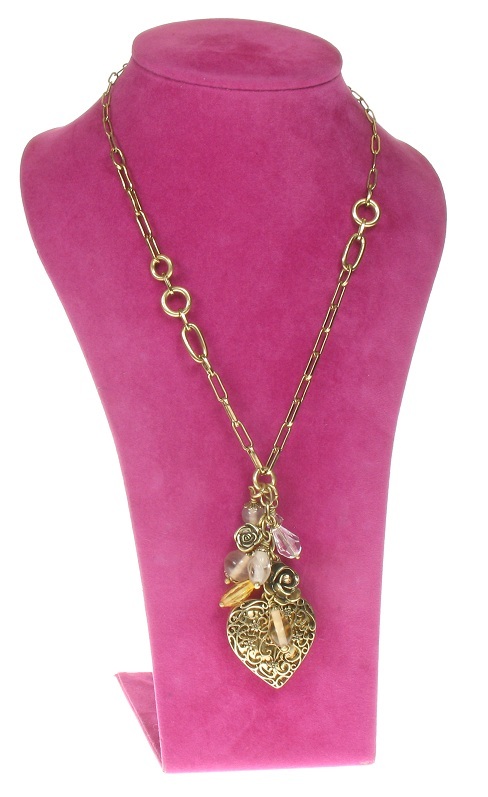 Decorated with various floral motifs and other charms, glass and semi-precious stone beads. The main focal is a heart locket with a filigree cutout over-lay (3cm/30mm) and a rose. The charms/beads measure from 8mm upto 3cm/30mm. The necklace is 24 inches/61cm to an adjustable 27 inches/69cm. A beautiful two stranded longer length necklace. 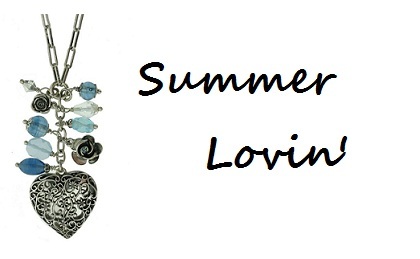 Decorated with various floral motifs and other charms, glass and semi-precious stone beads. The main focal is a heart locket with a filigree cutout over-lay (3cm/30mm) and a rose. The charms/beads measure from 8mm upto 3cm/30mm. The necklace is 24 inches/61cm to an adjustable 27 inches/69cm. Burnished silver plate with black accents. ©2019 The Midget Gem. All rights reserved.